I had done all the research, crafted all the copy, and produced every visual that effectively communicated my message. I let a smirk linger on my face. The relief one feels when their “big” project is finished tingled through my skin. All that was left was the easy part, transporting it and publishing it online. Hours and one (okay, two) tantrums of frustration later, I still was not finished. The perfect project I worked so tirelessly on turned into dislocated shambles. For reasons beyond my novice understanding, the project I created refused to render properly in the mobile browser I needed it to. Without the know-how to troubleshoot the issue, there were only two options for me: chuck it and figure out a different way to achieve my goal, or outsource it to someone who knew what they were doing. Like me, the majority of people faced with this situation do not have the time or resources to task or hire someone else to execute the project. That is one of the many reasons why HindSite Interactive created Easy WebContent Presenter. Presenter is a cloud-based, all-in-one content creation solution that focuses on the transferability of its created media to avoid the same type of situation I found myself in. The application is rooted in HTML5, but that does not mean that users need knowledge or experience with HTML5 to use Presenter. Rather, the HTML5 allows user’s finished products to look and function published online as well as they look and function in the creation application. Presenter aims to replace the numerous applications content creators use with just one application. Advertisements and banners, along with website landing pages, web and mobile animation, presentations, infographics, and mock-ups, can all be created using just Presenter. The shuffling between applications that have their own particular ways of doing things slows down creation time and the effectiveness of the final product. With one interface, in one application, the creation process is streamlined and easier to translate to both web and mobile devices. The bright and pleasing design and layout are as welcoming to novice users, like myself, as they are adept at handling the needs of pros. 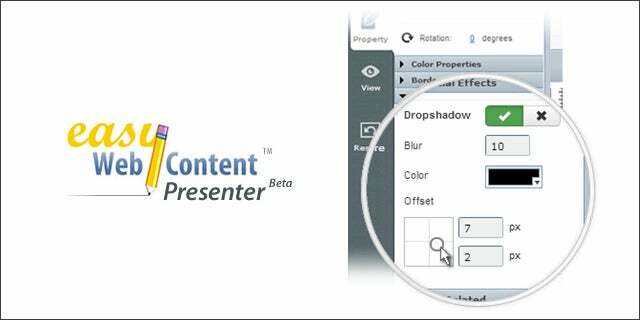 Easy WebContent Presenter is comprehensive in both its services offerings and its ability to reach a wide range of users. I decided to chuck my project and figure out a new plan. The animated presentation became a series of separate blog posts, something I knew I could achieve without technical difficulty. But the end result wasn’t the same. The separate posts divided the content and made it harder to understand, and the lack of animation made it less appealing to my audience. Easy WebContent Presented is free during the beta test. Easy WebContent was a showcased startup at our Tech Cocktail DCWeek mixer.